The first-floor of the Cross House abounds with Lincrusta, which is inset between the base molding and wainscot trim. 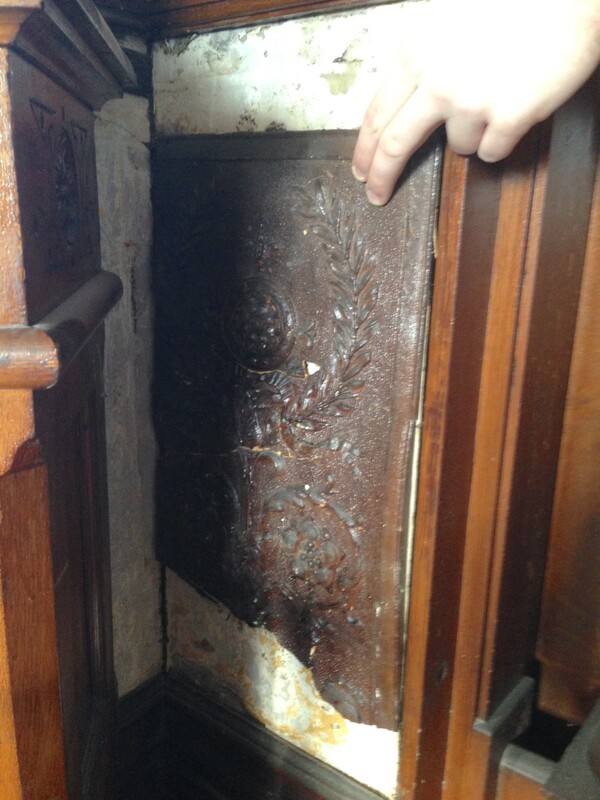 Most of the Lincrusta is intact, but there are missing bits and missing areas. In the above image I reveal the restored finish. The Lincrusta consists of two alternating panels, and a double row of Lincrusta trim above. 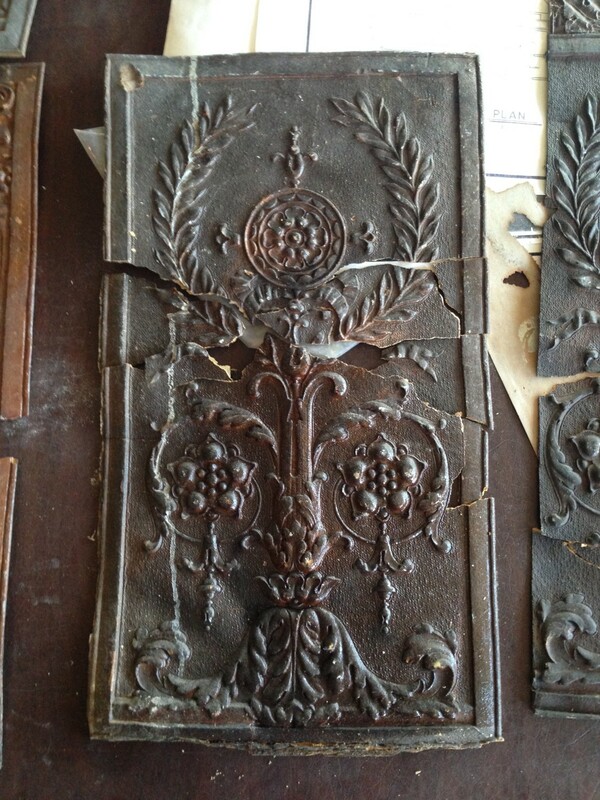 Over the decades, as bits of Lincrusta fell away, kindly souls had the good sense to store the bits in the basement. I inherited this treasure trove, but until recently all the bits was just a pile-o-bits. The other day though, young Brian and I, wild & crazy guys that we are, decided to sort out this puzzle. We had rather a good time with this section. In the image it looks pretty intact, but it is actually comprised of seven pieces we managed to puzzle back together. All this was accompanied by numerous shrieks of excitement in finding a bit perfectly fitting into another bit. The shrieks, I can assure, were of the most manly kind. The manly shrieking reached new heights when we were able to match one piece to its original location. We were able to match four pieces to their original locations. Golly, who knew that old bits of Lincrusta could be so much fun? This piece, brilliantly pieced together from three bits, proved a bedevilment. It is not a full-width section, having been cut on the right side to fit X location in 1894. But we could not find where X location was. Quite frustrating! The large bit, center-ish, fitted to a piece extant in the telephone closet. Much shrieking ensued. Perhaps however this shrieking was a tad less manly. Well, we were sooooo excited! 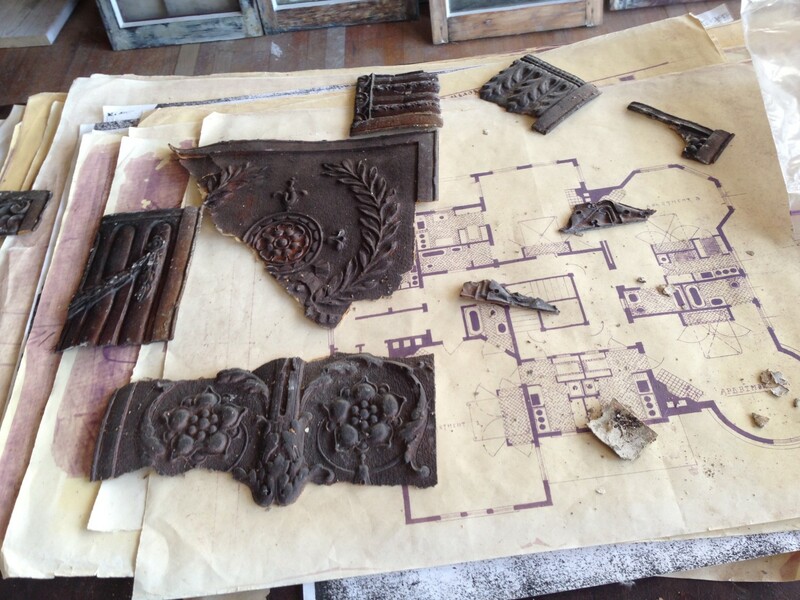 Oh, the bits are sitting on the 1929 blueprints of the second floor apartment conversion. I have NO idea how to reattach all these bits, and am hoping to receive expert advice from you. I assume that I will have to lay out all the bits, on a HOT day, in the driveway so the bits can kinda melt back into a flat shape (none of the pieces are actually flat). 10 Responses to A Lincrusta Puzzle! There are several sights that sell the adhesive made just for this product. My concern is will you be able to make the old Lincrusta soft enough to re-attach it. I did a quick search and found several companies that sell products for what you are looking for. If you search Lincrusta restoration several will pop up. They even sell kits that will reproduce missing parts by making a mold. And Ross, manly shrieking – LOL – I am so so delighted at your joy in this adventure. 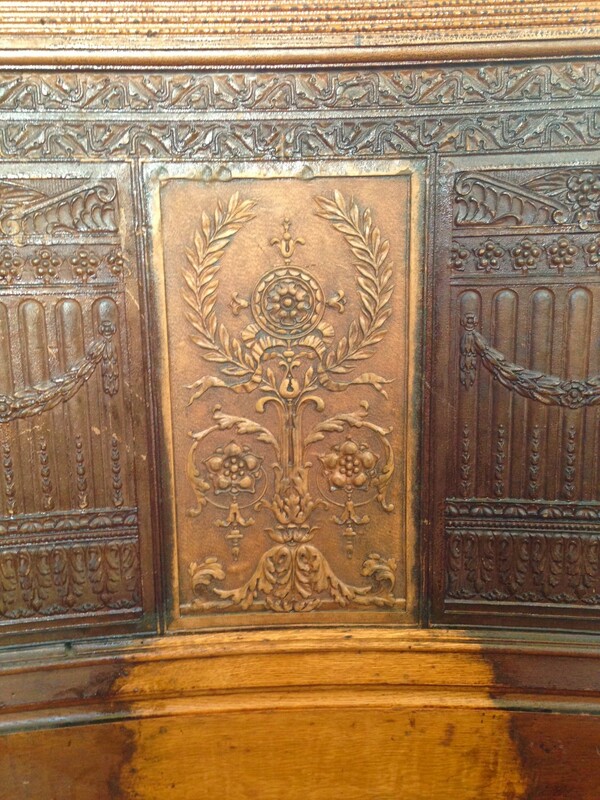 Bo Sullivan just sent me this link about your wonderful Lincrusta. 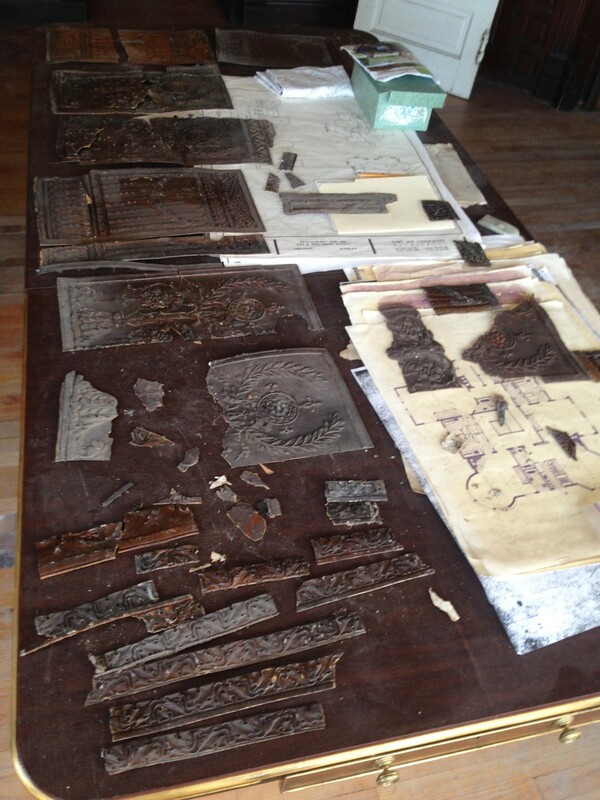 We are the Lincrusta trained: Restorers and Conservators of Historic Lincrusta Wallcovering (1877 – 1939) for North America. York Wallpaper still makes Lincrusta. They are still in the United Kingdom and York Has a location in PA. While your patterns may no longer be available, they have a great selection of dado panels (10 panel rolls) and borders. That is an option for you, and you could frame and hang the beautiful remnents in the phone room. They may have designs that are orginal to your time frame! I am still deciding which patterns I will use in my foyer. I have Derby in my kitchen and just love it!! Ross the finish for that pattern is original. The color exposed by stripping is the base color. It would have all been base coated to match then be pigmented glazed to look like carved wood and sealed with Shellac. The shellac is the reason it has turned so dark almost black. Feel free to contact me if I can be of more help. For anyone interested in new Lincrusta it is still made in England by Lincrusta since 1877. The patterns available can be seen at Lincrusta.com approx. 1890 an embossed paper product called anaglypta was invented as a less expensive version of Lincrusta and is still made today in England and was distributed through a company called York Wallcovering. Stephan, Since we now have an expert on board might I question you about Brewster Wall coverings? Are they a subsidiary of York Wallpaper? I’ve seen some of what I thought were originally Anaglypta & Lincrusta patterns. Can Ross’s pattern still be produced ? His foyer convinced me that I must too have dado panels in my small foyer. The question now is which pattern and before or after the bathroom is ” walled ” !!! See what you started Ross? I shall blame the Cross House. They are two separate companies and Brewster is a distributor only. Ross’s pattern is no longer in production. Only the patterns found on Lincrusta.com are currently available. 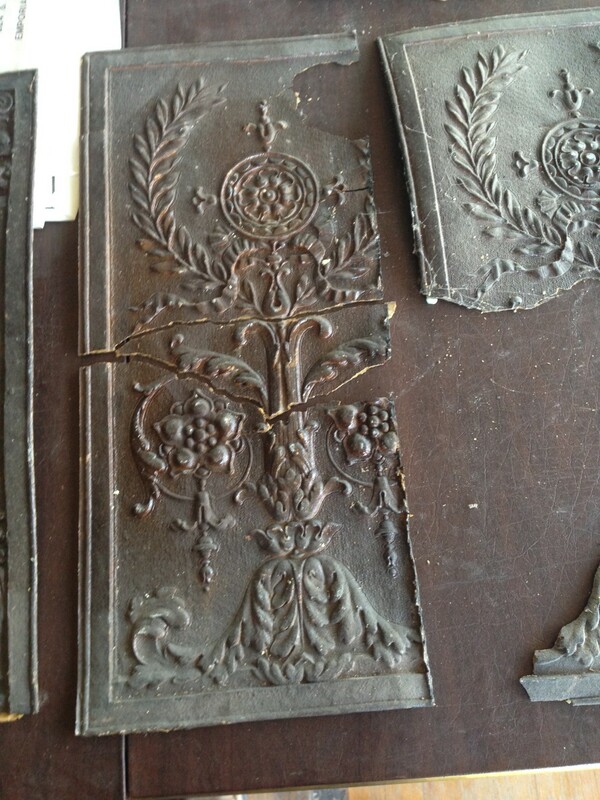 That being said, for purpose of restoration we can make individual panels for him. I sent Ross a before/after as an example. Perhaps he could share it on this forum.